Two long-range missiles fired by Gaza terrorists struck the port city of Ashdod on Sunday afternoon. No physical injuries were reported. 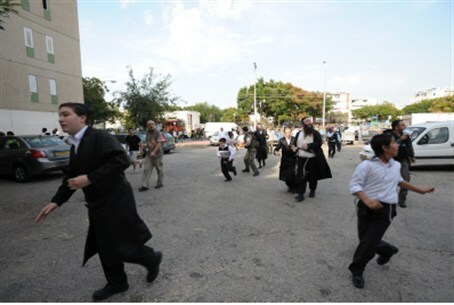 Two long-range missiles fired by Gaza terrorists at Israel exploded in the port city of Ashdod on Sunday afternoon. Both landed within residential areas in the city. Miraculously, no one was physically injured, although residents suffered anxiety and trauma symptoms in response to the attack. Six people were sent to a center in the city that specializes in treating those suffering traumatic shock. First responders raced to the site, a parking lot next to an apartment building, to offer assistance. A number of vehicles that were parked in the area were damaged in the attack. The community of Gan Yavne also came under rocket fire at about the same time, as did the major city of Be'er Sheva, where an apartment building sustained heavy damage and other surrounding communities. Three missiles were intercepted by the Iron Dome anti-missile defense system, although two others landed in the city, including one that exploded in an open area. In Be'er Sheva as well, miraculously no one was physically injured and residents who suffered trauma and anxiety were being treated by medics on the scene. Those suffering hysteria and who required more intensive care were evacuated to the city's Soroka Medical Center for further assistance. Minutes earlier, the coastal city of Ashkelon also came under heavy rocket fire, with the Iron Dome anti-missile defense system intercepting and neutralizing two of the missiles. No one in the city was physically injured. The Israeli government has warned Gaza's residents and the Hamas terrorist government that it will step up its Operation Pillar of Defense if the rocket fire does not cease.